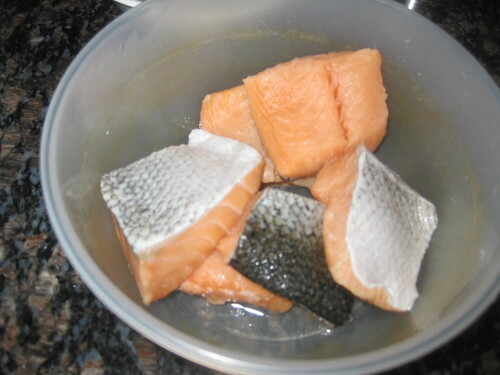 Remove the scales n skin from salmon fillets,cut in to small pieces and wash well and drain completely and keep aside. Take a small bowl,add red chilli flakes,black pepper powder,coriander powder,ajwain and kasoori methi,and salt mix well. 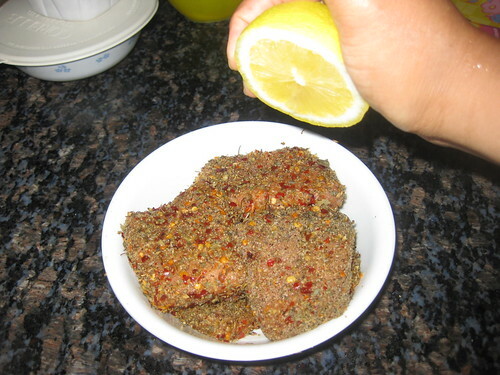 Now coat the fish on both sides with five spices powder. Keep it for 20 -30 minutes. When u r cooking before 15 minutes add lime juice to fish pieces rub and keep for 10 minutes. 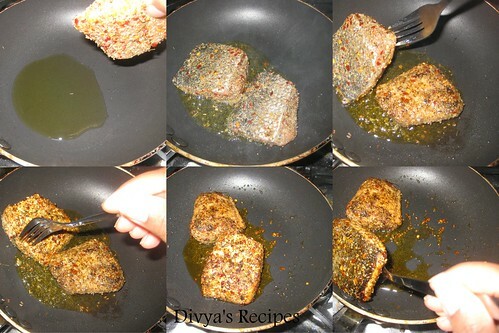 Heat oil in a non-stick pan, place the marinated fish and fry for 14 -15 minutes on low to medium flame. Once its nicely browned,flip over gently to the other side and roast fish for another 10 -12 minutes till browned. Love the colour of the fried fish,seriously makes me drool. 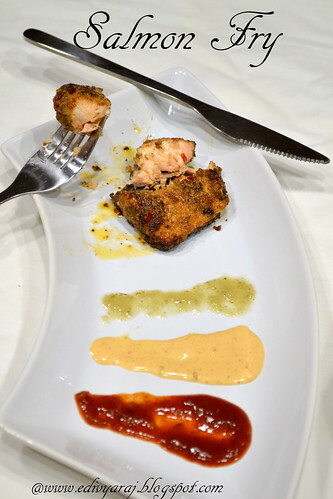 Nice idea to incorporate the spices in this fish.love it. 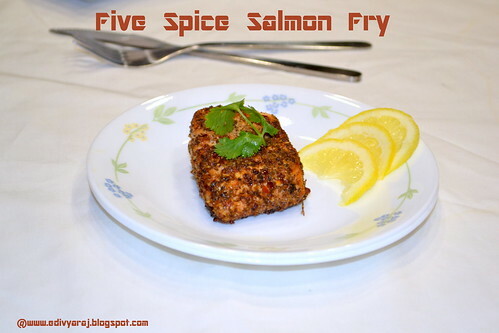 Simply mind blowing pics of salmon fry. Loved the garnishing. 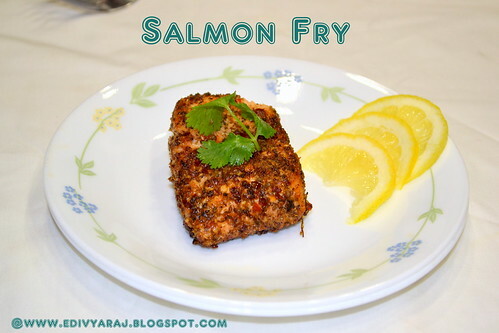 divya, that's a lovely looking delicious salmon fry. This is really nice.. I will make it.Loved the clicks. 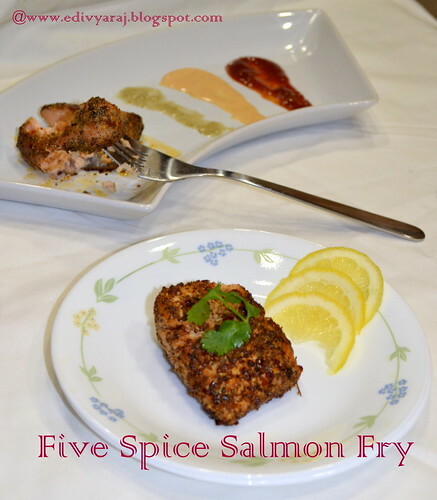 Like the herbs and spices to add to this salmon, yum! Looks very good Divya. The platter looks very professional. 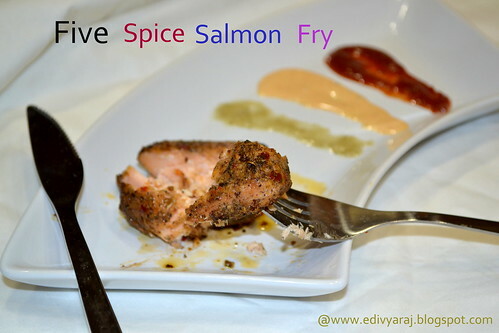 Super tempting fish fry, looks so yummy. Love to have the plate Divya..Can't resist...Yummy and uniquely spicy. I love the spice combination too; looks very tempting Divya. lovely fish fry ! love the kasuri methi in it! Perfect looking fry.. Love them.. Looks & feels flavorful ! 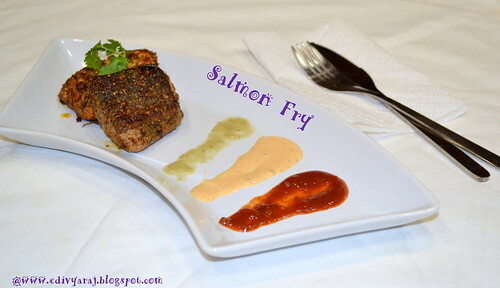 These pictures are so tempting, flavorful & aromatic fried fish! Divya, you are a genius! Just tried your recipe last night and it turned out mouthwateringly delicious...much like your posted pictures! I must admit I was a little apprehensive at first since there was no mention of ginger garlic (since I invariably use it on other types of fish!) However since I had never actually cooked salmon at home( apart from eating it at restaurants) I decide to trust in your recipe!